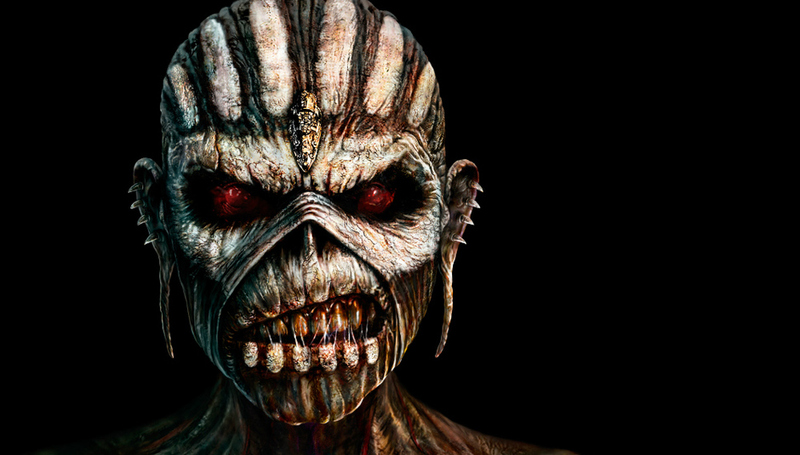 A live blog of shopping for the new Iron Maiden record in a supermarket. 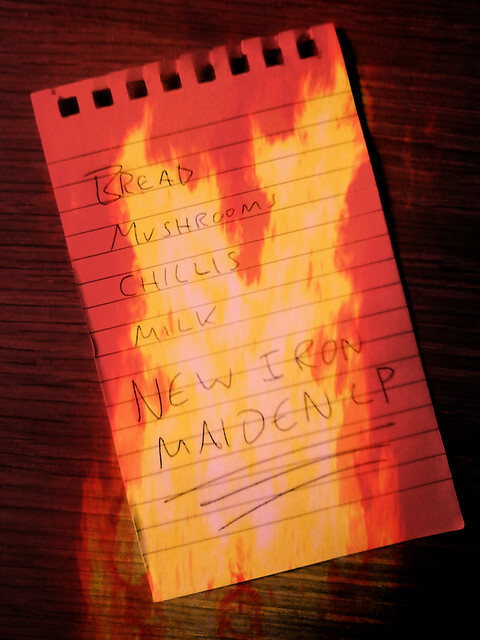 3pm: I am thrilled by reports that my favourite profit-distorting, tax-dodging multinational grocery store is to stock vinyl and the first one they’ll stock will be the new album by my favourite immortal NWOBHM band, Iron Maiden. It’s like when two worlds collide. Doubtful that the tiny Tesco Expresses that have popped up on every single street corner will be stocking The Book Of Souls, I head to the nearest sprawling Tesco Extra hypermarket with my shopping list in hand. Having no alternative means of transport and no change for the bus, I take the journey by foot, which is a good 45-minute walk. Just call me The Trooper. Excited about buying a new record at a different shop, en route I listen to Iron Maiden’s hits compilation Eddie The Great. 3:30pm: Still walking to Tesco. This is taking longer than a signature Murray/Smith/Gers triple-headed guitar solo. I wish I could fly, on my way, like an eagle, fly, as high as the sun, on my way. Or at least like Captain Dickinson in a jumbo jet. 3:45pm: Entering the sliding-doors of the Tesco Extra I notice that the basket-only aisles have signs reading “666 items or less” which I find most unnerving. It should be “fewer”. 3:48pm: I wonder if I should have picked up a trolley instead of a mere basket. This album’s going to be pretty heavy, after all. 3:54pm: The tropical fruit aisle is tempting me. Can I play with mangoes? No time! Got to find that chuffing Maiden LP. 3:58pm: Humming the tune to Iron Maiden’s 2006 album track ‘These Colours Don’t Run’, I find myself lingering for a few minutes on the Persil Non Bio. 4:05pm: I can’t find the blasted thing anywhere. I check the “tin foil” section in case they keep all the metal together. 4:12pm: Finally! I’ve found Tesco’s vinyl section! But it only seems to stock spatulas, rubber gloves and lunchboxes. 4:18pm: I feel a panic attack coming on. I’m a man on the edge. The hellishness of this place would give the willies to Eddie himself. Jaded old couples project their long-lingering frustrations with one another onto an argument about apple varieties. Underpaid shelf-stackers try to playfully flirt with one another while wearing unflattering uniforms in this most sexless of places. Dead-eyed singletons decide which ready-meal they’ll eat alone tonight in front of the entitled glow of the latest Jack Whitehall sitcom. Overworked and underappreciated mothers, too bleary-eyed to resist, passively allow their Minions-branded offspring to fill their trolleys to bursting with dinosaur-shaped breaded turkey and Haribo Tangfastics. The sheer oppressive airlessness of this place. The overhead lighting, brighter than a thousand suns. 4:23pm: “Don’t look to the eyes of a stranger,” Maiden warned me in 1998. Ignoring their advice, I ask a member of staff for help. She leads me up an escalator to a gigantic Sticker Man. The man, who is busy stickering stock, works in the Entertainment section. Oh well, I always preferred CDs anyway. They take up less space, damage less easily and you don’t have get up to change the side. 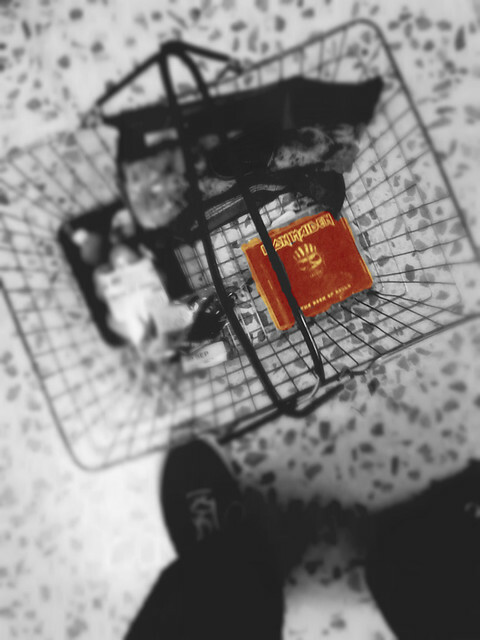 4:27pm: The Book Of Souls CD is encased in one of those big, plastic anti-theft devices so there’s no point in heading for the self-service checkout. Instead, I have to queue for around 6 minutes, which at least made it feel 12% like being at Record Store Day. Related: Read more by JR including an interview with Mumfords' banjo.